Welcome to the sixth and penultimate step in our free professional learning series on building your PLN. What content curation is and the benefits of content curation. A simple framework for getting started with content curation. A range of different tools that you can choose from to make content curation easier. We are living in an era of information overload. There is so much content shared online that we actively seek out people who have good content curation skills to help us “sort the wheat from the chaff”. A person with good curation skills saves us time by sifting through the vast abundance of content on the internet to select the best, most relevant resources on a specific topic or theme. The curator organizes, manages, and collates for their own use and shares with us. If you look closely at most educators with a high following on social networks like Twitter, Facebook, Pinterest, or Instagram you’ll notice that most are great content curators and share excellent resources. Their sharing and content curation skills helped them build their PLN. Video: What Is Content Creation? This 90 second video provides a useful overview of content creation. Of course, content curation is nothing new. It has been an important skill for hundreds of years — think of newspapers, art galleries, museums, or simple storytelling. Teachers have always been curators too — bringing together the most worthwhile materials to help their students learn. In the past, this might have been limited to books, posters, concrete materials, guest speakers, etc. But of course, there are so many wonderful digital resources available now too. Content curation has been happening since the beginning of time in some form or another; however, it’s becoming increasingly worthwhile and complex as the volume of information online continues to increase. 21st century content curation can involve finding, verifying, organizing, annotating, remixing, creating, collating, and sharing. This might sound overwhelming but it doesn’t have to be. Luckily, there are some excellent free digital tools for content curation which we’ll explore in this post. To find, organize, and manage information and resources on specific topics. To stay informed about the latest information on specific topics which leads to professional growth. To learn through the process. As you search for and curate the best resources, you reflect on their value and you may develop new ways of thinking. To help build their PLN. Networks actively seek and follow good content curators because they save us time. To learn how to curate themselves so they can teach students how to curate content for research, their interests, and passions. Curation is an important part of being digitally literate. Learn more about students as content curators in this excellent short video by John Spencer. We made this diagram to simplify the process of content curation. Feel free to use it on your blog or share with others. 1) Read — Visit your favorite blogs or social media accounts, use curation tools like Flipboard or Feedly, or perhaps subscribe to newsletters. This consumption might mostly include text-based materials but don’t forget podcasts and videos too. FILTER — Before moving on to the next step, you need to filter. You do not just want to share anything and everything. Check out Are You a Curator or a Dumper? by Jennifer Gonzalez. You also need to verify and make sure you don’t share anything that might not be true. 2) Editorialize — Here is where you need to add your own touches to your findings to help others. This involves considering your audience and what they might be interested in. You might even put together a few similar resources that complement or contrast each other. CREATE — Before sharing, you might consider if you could create something with the content. 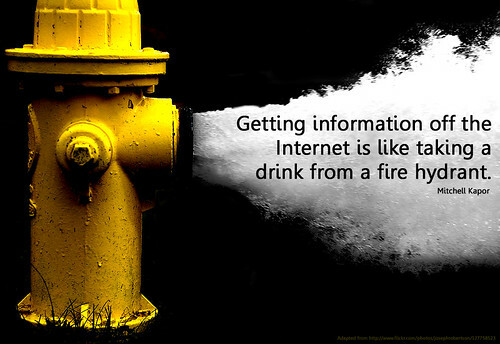 This could be putting your favorite quote on a graphic to make your findings more shareable. Or maybe you could make your own infographic to share based on your findings. 3) Share — As we’re discovering throughout this PLN series, you can share with your PLN in a wide range of ways. Commonly, teachers will share with their network via their blog or social media. 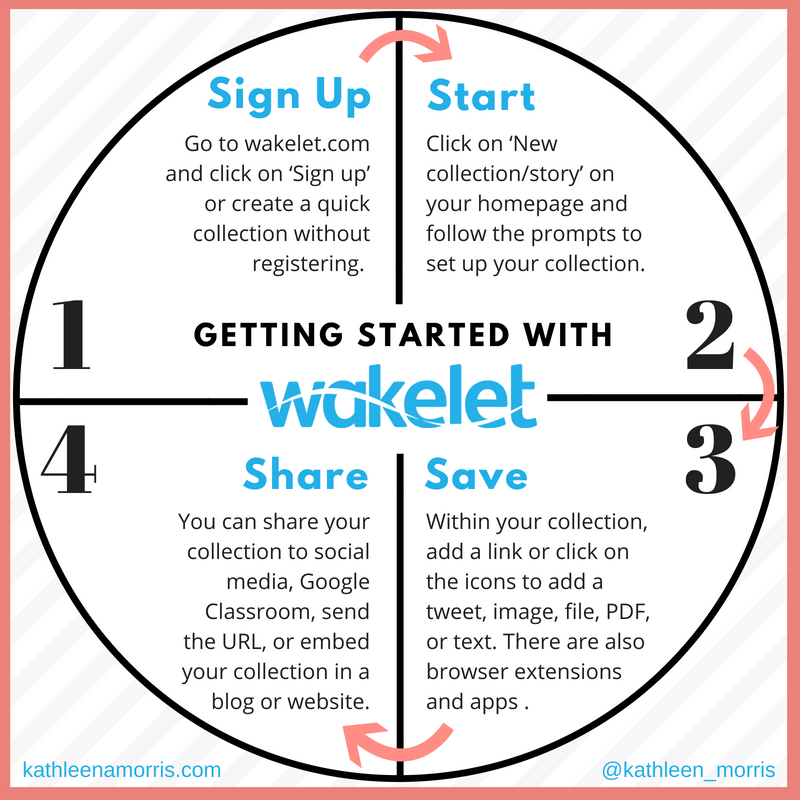 Sometimes you might want to compile resources together into one location using a tool like Wakelet, Google Docs, or Padlet. Once you share, be willing to interact with your PLN. Invite them to comment by asking questions and don’t forget to reply to any comments. Needless to say, when you’re sharing other people’s work, you should make it clear where it’s from. Note: we’ll be explaining the tools mentioned above further on in this post. Content curation is not just finding a link and putting it in a tweet. Your PLN is not going to get much value out of that. As the curator, you can challenge yourself to do a little more from time to time. Here are some examples of curated work from educators. Tony Vincent is well known for his graphics he creates for social media. These are always shared extensively. Shannon McClintock Miller put together this Padlet with ideas of books to celebrate International Dot Day. Jake Miller regularly makes GIFs to enhance his tweets which are well received by his followers. Quotes are always popular additions to tweets. Check out our post on quotes if you want to learn how to make your own. So much truth in this quote from @rushtonh The power of an authentic audience can’t be underestimated. BookSnaps are a popular choice for sharing snippets of professional reading. Tara Martin coined the term BookSnaps and you can read more about them on her website. Here is an example of a simple BookSnap from Jennifer Tod. Emojis can catch a reader’s eye and make a nice addition to a summary for the time poor. There are a plethora of free digital tools you can use to help with content curation. Tools generally fall into one of these three categories. News discovery tools — Use your preferred news discovery tool to select and aggregate the content. News discovery tools save time by feeding you the most relevant content. Examples of news discovery tools include Feedly, Flipboard, Nuzzle, and following a hashtag on Twitter. Curation tools — Use your preferred curation tools to display your content with context, organization, annotation, and presentation. Examples of curation tools include Scoop.IT, Flipboard, Diigo, Wakelet, LiveBinder, or a blog. Sharing tools — Select which networks you share your curated content on. For example, you might share the content on Twitter and Facebook. Some people will choose to follow your curated content via your curation tools (such as follow you on Scoop.IT, Pinterest, Flipboard Magazine, or Diigo). Which tools you use, and how you curate, is very personal. You might have a set workflow that you follow regularly, or you might dip in and out of using different tools depending on your mood and needs. You can dive deeper and write a detailed elaboration. You may find that the act of writing helps to transform your vague ideas into well structured thoughts. You can customize and organize vast amounts of information in meaningful ways. You might write a post about a single article you’ve read, or create a round-up post. This is where you share links to great content from multiple sources about a specific topic. Ideally, you’d add your own short annotations too. Refer to Silvia Tolisano’s post on blogging as a curation platform for more information. Larry Ferlazzo finds and shares the latest news of a range of educational topics on Larry Ferlazzo’s Websites of the Day as well as curating resources into his ‘Best of’ lists. Doug Pete publishes a weekly round up of posts that caught his eye on Ontario Edublogs. Richard Byrne curates content on a daily basis on his blog. He adds his own insights, summaries, or how-to videos to help his audience. For example, when there was news about Gmail, he summarized this information and added a ‘What does this mean for teachers?’ annotation. For those who are new to blogging, we recommend you work through our personal blogging series. This series takes you step-by-step through the process of setting up your own personal educator blog. Wakelet allows you to save, organize and tell stories with content from around the web. This is a relatively new tool that is becoming very popular with teachers. You can sign up for free or create a quick collection without signing up. There’s also a browser extension to save links from the web. Your collections can be public or private. You can also embed collections on any blog or website. Find out more about Wakelet including how to get set up and how to use it in the classroom in this post. Nuzzel is a ‘news monitoring and research tool’. If you’re on Twitter or Facebook you might have found that it can be serendipitous in nature. You sometimes just ‘see what you see’ and there are no guarantees that you won’t miss the most interesting or important stories. When you sign up for a free Nuzzel account you can get a curated email sent to you daily with the top stories from the people you follow. This is really handy to stay abreast of important stories. You can then explore those links and decide whether they’re worth sharing with your PLN. With Nuzzel, you can curate your own newsletter for your followers too. You can include stories you find interesting and add a personal touch with a headline and comments. Your PLN can subscribe to your newsletter and you can share it on social media like Troy Hicks has done here. Sometimes you’re browsing the web or social media and you come across an interesting article, video, or link. You’d like to read it but you might be short on time. This is where Pocket comes in. You put that item ‘in your Pocket’ for later. You can save directly from your browser or from apps like Twitter, Feedly, or Flipboard. You can view it again when you’re ready — from your computer, phone, or tablet. You can even view the item when you’re offline. When you’ve reviewed the items you’ve saved, you can then decided if there are any you’d like to share with your PLN. The ad-supported version of Pocket is totally free. Watch how this user reads his saved articles on the Pocket app. Diigo is a free social bookmarking tool that allows users to share online resources like websites, articles, and online tools in a private or public group format. The benefit of using a social bookmarking tool is it allows you to organize and store your bookmarks online rather than in the browser of your computer. This means you can log into your account, on any device, at any time, and easily find your bookmarks. Watch the following video by Ms. Lamm to learn more about Diigo. Evernote enables you to collect information, curate resources, find your resources, and share with others all from the one workspace. With Evernote, your notes, web clips, files, images, and voice memos can be sorted into folders, tagged, annotated, edited, given comments, searched, and accessed whenever you need them on any of your devices. Evernote also enables you to view, input, and edit data even when offline. Watch this short overview by Lindsey Maczynski about curation using Evernote. Note: While there are still many teachers who enjoy using Evernote, changes to the free plan in 2016 resulted in some educators switching to other options. Flipboard’s strength is you are able to bring your social networks such as Facebook, Twitter, Instagram, LinkedIn into one location alongside your favorite news sources and anything else you like to read, or watch (like YouTube). On top of this, it’s easy to share your favorite content with your social networks and easy to curate your favorite content into Flipboard magazine(s). Flipboard is a powerful tool for curating your favorite content into magazine(s). Quickly curating and sharing articles you like directly to your own magazine from within Flipboard (or using the Flip It bookmarklet in your web browser), while also sharing the articles with your social networks at the same time! Other Flipboard users can subscribe to your Flipboard magazine(s) allowing them to easily read the articles you like to share. Anyone who clicks on a link can read your magazine using their web browser regardless of whether or not they have a Flipboard account. ISTE Insights — example of how you can use a magazine to curate conference resources. Vicki Davis’ Education, Teaching & Tech. Kevin Hodgson’s Making Learning Happening. Watch this video to see how Sue Waters uses Flipboard. You’ll find detailed step-by-step instructions on how to set up and use Flipboard here. LiveBinders is your digital binder for all of your online content and learning. With your LiveBinder, you can create a central hub full of resources on a topic that you choose. Almost everything that you can think of can be added to your LiveBinder – links to websites, YouTube videos, Flickr images, PDF/Microsoft Word documents, and QR codes are just some examples of rich content for your LiveBinder. Check out Joy Kirr’s Genius Hour LiveBinder to see how Livebinder can be used for curating resources. Refer to the Educator’s Guide to LiveBinders to get started. Pinterest is a virtual bulletin board or pinboard that allows you to find and curate images, videos, or websites. The visual aspect of Pinterest is a key reason why it’s captured the interest of so many. You add items to your Pinterest accounts using pins. A pin is a visual bookmark which could be an image, video, slideshare, or a web clip of a site. When you click on a pin it takes you to the site where the pin was sourced from so you can learn more. Some people think of Pinterest as a social media platform but it’s really more like a search engine. Pinterest calls itself a visual discovery engine. Watch this video tutorial to learn more about Pinterest. You can check out how we use Pinterest here. Scoop.it allows you to create a web page to share what you find interesting with the world. It does this combining clever curation tools that make it easy to gather content in one place with a wide range of sharing functionalities to let people know about your Scoop.it page. Watch this video to learn more about Scoop.it. Sparks for Learning – Resources for Today’s Educator by Cyndi Williams, Ed.D. For more information on Scoop.it refer to how to keep your content fresh with Scoop.it. Kay Oddone created this diagram based on a presentation by Joyce Seitzinger. It summarizes some of the pitfalls you want to avoid as a content curator. 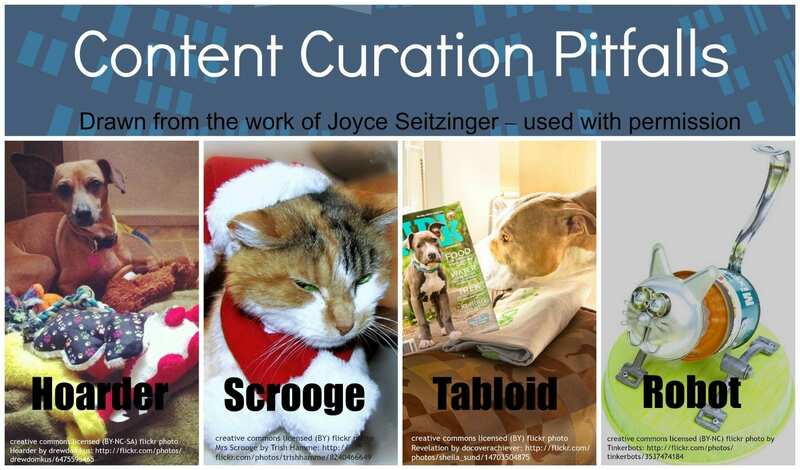 Visit Kay’s post to learn more about content curation. Remember, while there are tools that can help with the aggregation and organization of all the great resources you’re coming across, technology can’t do the curation. This is the job for a human who knows their audience (their PLN). Find the tool(s) that you prefer to use for news discovery, for curation, and for sharing. Curate the content that helps you, and is helpful for others. Make it part of your routine to curate and share content. As you get going and try different tools, your wants and needs might evolve. You’ll figure out the pros and cons of different tools as you use them. Stick with it and you’ll begin to develop your own workflow that works for you! Want to see an example of a workflow? Richard Byrne is a master curator, keeping hundreds of thousands of teachers in the loop on a daily basis. Watch how he uses Feedly and Google Keep together. Watch David McGavock’s video to see how he use Netvibes, Scoop.IT, and Diigo as his curation and learning tools. Review our list of popular curation tools. Leave a comment on this post to share what tools you currently use (and why) for news discovery, curation, and sharing. Tell us which of the curation tools you plan to try and why. Do you have any other tools to add that you’ve tried or heard about? Set up an account. Choose one of the popular curation tools such as Flipboard, Nuzzel, Scoop.it, or Pinterest. Sign up and leave a link to your account so others can take a look and follow you. Interesting tweet. Find an example of a tweet where someone has curated and shared some information in an interesting way. Maybe they included a summary, visual, sketchnote, GIF, or quote. Share the link to the tweet so we can take a look! What do you see as the advantages of curating content? What tips do you have for newbies? What did you learn about content curation that you didn’t know? What are your future goals for content curation? 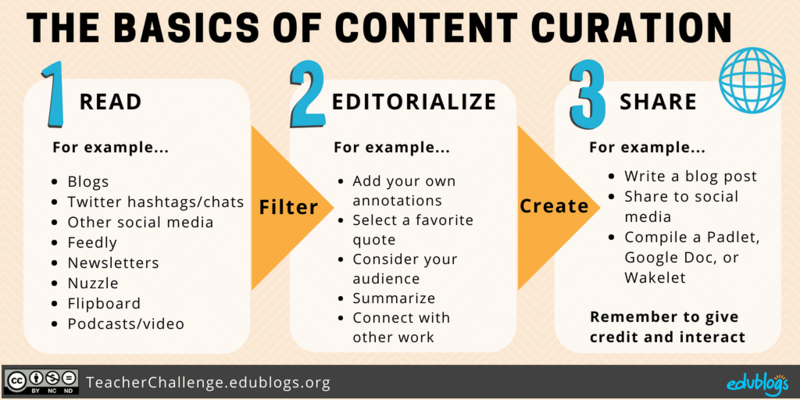 How could you teach your students something about content curation? Also feel free to leave a comment to ask any questions or share your tips. Step 1: What is a PLN? The only tool that I currently use for news discovery/curation is Pinterest, but I plan to try Nuzzel and Pocket for news discovery, LiveBinders for curation, and use my personal blog/social media sites to share my creations. I hope to become better at content curation so that I can share this knowledge with my students and help them become better at organizing information in a way that helps them learn best!